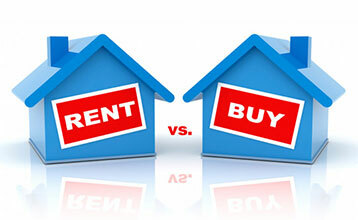 Rent or Buy, Which is Right for You? If you choose a home that you can afford, the payoff can be great. When you make a mortgage payment each month, you build equity in a place of your own (unlike a rent payment). Equity is the difference between the value of the home and your outstanding mortgage. The longer you stay in your home (and the more payments you make), the more equity you’ll have. And, unlike most things you buy, a home will almost certainly increase in value over time – which builds even more equity. As you build up equity in your current home and comfort level in being a home owner, it may be easier to move up to another home in the future. As a homeowner, you can decorate and renovate your home any way you like. You don’t have that luxury as a renter. Owning a home also gives you a new sense of pride in your surroundings. Your family may also feel strong ties to your community. When budgeting, you’ll have to factor in more than your monthly mortgage payments. You should consider things like maintenance and repair expenses. You home will probably increase in value as time goes by, but don’t count on getting a big return quickly. If you need to sell your home during the first few years of homeownership, you could lose money given the various costs involved, such as realtor fees and possible penalties for breaking your mortgage before your term is up. There’s no guarantee your house will increase in value, especially during the first few years. Although, historically, over the longer term, homes will have proven to increase in value. next post: Are You Ready for Homeownership?